Until you can be more responsible. I think this might be the most awkward agreement to dissolve an engagement, ever. What came next? Awkward silence? That moment when you say, “Wait a minute. . . did we just. . . break up?” (Beat.) “I think so.” ? Or were they just like, “Aight, bye.” ? oh my god, that’s terrible. Certainly hits home, though. It is terrible, but I find myself hoping that this was the end, and they didn’t become one of those desperate on-again, off-again couples! Hey, she was lucky!!!! No marriage, no divorce!!!!! 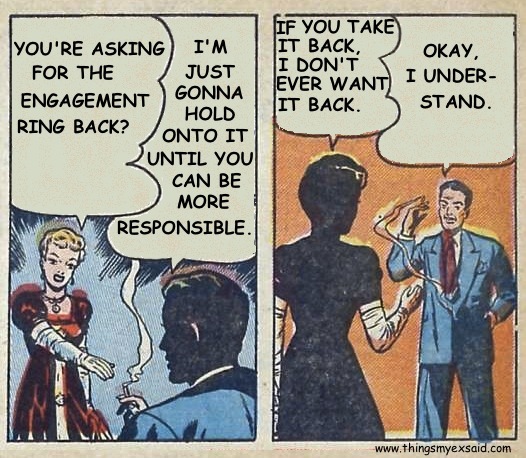 my response would have been ‘i will think about what you said’…pawn the ring and go on vacation..come back with a tan and advise mr “i’m going to hold onto it’ that in case he could not figure it out from my 10 day absence? i decided to break up with him and neither the ring nor my attention was available to be held onto any longer.